Will you be in Melbourne? Love to see you at the wind-down for Journeys for Climate Justice. Drop in for 9 minutes or 90. We have had a great year, and more is to come for 2015. Our AGM and launch of the website on 23 November went really well. Prof David de Kretser and Dr Colin Long did the launch most ably. 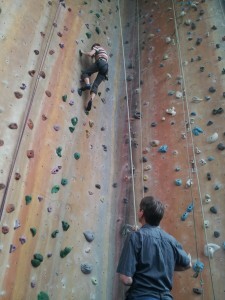 And on a lighter note, Helen and Jack are taking turns on the climbing wall. What better way to finish up after our regular JCJ meeting.